With Bermuda’s British, Portuguese and West-Indian influences, it’s hard to say exactly what constitutes local cuisine. But regardless of a recipe’s origins, there is one common ingredient in most local dishes and – you guessed it- it’s fish! Although there are many ways to Savour the Sea, below are some of our favourites. Although imported, Codfish is cheaper and lasts longer than fresh fish, which is how it became a staple in local cuisine and the key component of our national breakfast. 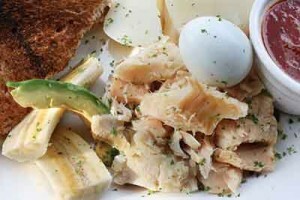 Traditionally served on Sunday mornings, the meal consists of boiled salted codfish and potatoes covered in a rich homemade sauce, served with a hard-boiled egg, banana, and avocado. Try it at Flanagans Pub & Restaurant on Front Street (famous for their ‘Barry’s red sauce) where this breakfast is served on the weekends. This variety of dolphinfish is found in the waters around Bermuda. At many restaurants across the island you’ll see this choice fish on the menu, prepared in a variety of ways. Overlooking Achille’s Bay in St. George’s is a popular restaurant called ‘The Beach House at Blackbeard’s hideout’. There you can enjoy mahi-mahi as a gourmet entrée, titled ‘Dorando Tropical’, the dish consists of pan fried mahi-mahi filet topped with a tropical salsa of tomato, mango, onion and lemon butter sauce. This Bermudian-British dish came over with the first colonists. It’s a spicy soup, that’s rich in flavour, made from fish stock out of fresh, local fish, (even fish heads and tails get thrown in the pot). It is different in content, taste and texture to any New England style fish or clam chowder. Long, slow simmering is key, then black rum and Sherry peppers are added to give a distinctly local flavour. Try this award winning dish at The Lobster Pot on Bermudiana Road. Sandwich preferences vary from culture to culture. Battered and fried fish, topped with tartar-sauce, coleslaw and hot-sauce, served on the bread of your choice (try raisin bread! ), may sound unappealing to some, but it’s one of those things you really have to try before passing judgment. 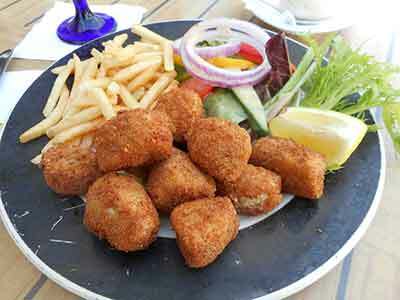 There are a number of spots to taste this national favourite, we recommend Coconut Rock on 13 Reid Street. 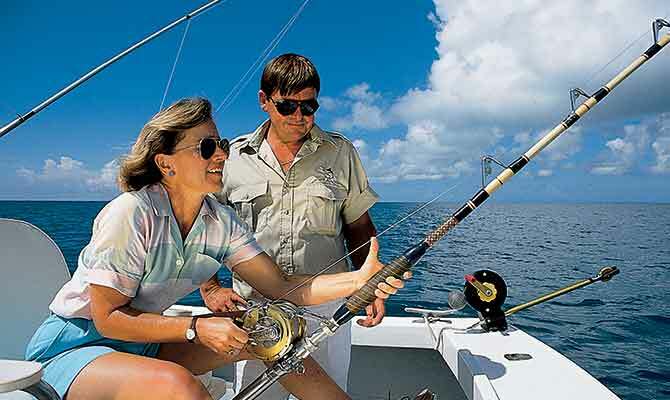 The local ‘rockfish’ is actually black grouper, a choice fish found around Bermuda’s reefs. The fish is a member of the sea bass family, and has white meat that is firm and mild in flavor. You will find rockfish prepared tons of different ways at restaurants across the island. The more traditional Bermudian recipes pan-fry, then top with bananas and toasted almonds. Try it at Bonefish Bar & Grill, renowned for their seafood, located across from the ferry Terminal in Dockyard. We hope that there will only be two places you see a shark while you’re in Bermuda – at the Aquarium and on your dinner plate. Yes its true, sharks are considered a delicacy here, and the traditional local recipe turns them into well-seasoned mincemeat. Today it’s rare to find on restaurant menus but luckily not impossible. A new restaurant opened in the city last year specializing in Bermudian seafood. Be sure to check out LITT (Lost in the Triangle) on Reid Street. Pot-pies are also very popular here and we make them our own with local flavours and ingredients. But if our curried chicken or lamb pies are not exotic enough for you, then try a curried mussel pie, made with fresh Bermuda mussels. There are not too many restaurants that still serve this traditional dish, but you can find it on the menu at the Frog & Onion, a popular pub in Dockyard. You’ll also find fresh caught tuna on many menus across the island… and what a difference the freshness makes! The common way to prepare this beautiful fish is to sear it on all sides. At The Point Restaurant, in Rosewood Tucker’s Point Hotel, you can experience a bold entree dish which fuses the local fish with asian flavours. 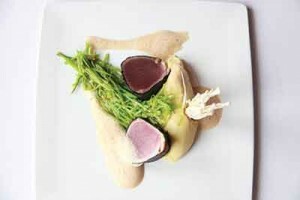 Seared tuna is wrapped in a Nori sheet then served with Wasabi mashed potatoes, gingered snowpeas and enoki mushrooms. With our warm, coastal climate it’s no wonder that sushi is so popular here in Bermuda. You’ll find sushi outlets all across the island, it’s a lovely way to savour the flavours of the sea with fresh fish, seaweed and eboki (fish eggs). At Henry VIII Restaurant Sushi Bar & Pub in Southampton, they do amazing sushi and will gladly customize a roll to suit your liking. Just ask them to make yours with fresh Bermuda fish for a rare treat. Enjoy outside on their patio which overlooks the beautiful south shore beaches, or order to go on a Wednesday night to receive a 20% discount! Some say that tuna is the chicken of the sea, but in Bermuda we beg to differ. Wahoo is served in abundance here and this firm fish tastes amazing when battered and deep-fried in little bite sized chunks. Dip them in some home-made tartar sauce and you’ll feel like a kid again, eating a Happy Meal for the very first time. 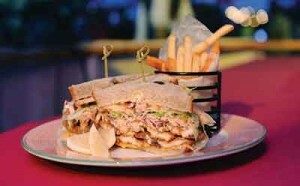 Try them at Wahoo’s Restaurant (the name says it all), in St. George’s.